Hawksbills live in tropical seas around the world, using their sharp beaks to feed on sponges and other animals in the crevices of rocks and coral reefs. 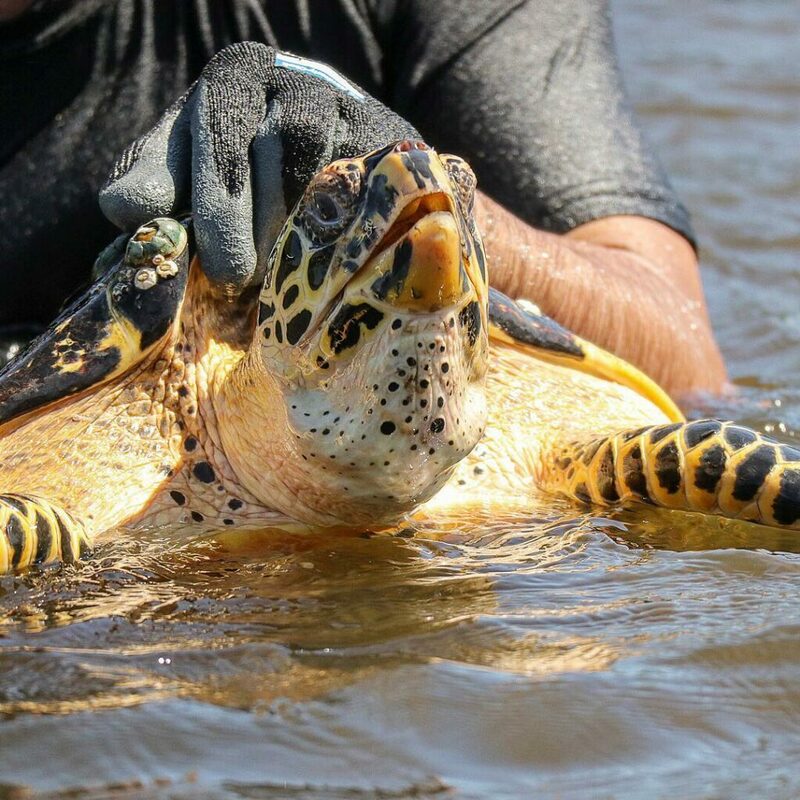 Barely ten years ago they were thought extinct in El Salvador and neighboring countries, but intensive research has revealed a remnant population of turtles from Mexico south to Peru. Unlike other populations around the world, they forage and nest in mangrove estuaries. El Salvador contains 40% of the nesting sites of this eastern Pacific population, with fewer than 500 nesting females. This critically endangered species is threatened by habitat loss, egg collection, fishing bycatch mortality, pollution, and especially the wildlife trade, as their shells are used to make tortoiseshell trinkets. While in El Salvador I was fortunate to participate in a program with ICAPO, the Eastern Pacific Hawksbill Initiative. In setting a single net we were incredibly lucky to catch four turtles. We sampled their DNA, weighed, measured, and tagged them and released them back to the estuary. ICAPO works with local residents to protect and collect eggs to safely rear before return to the ocean. I was fortunate to meet fishermen and school children in a village now dedicated to turtles, with sea creatures painted on many of the buildings. Once they sold the eggs to restaurants, but now they are paid to contact researchers who take the eggs to local hatcheries. Since the turtles are highly valued, they have adjusted their fishing methods to protect them. These efforts provide an inspiring model on how creating a symbiosis between people and wildlife can help endangered species make a comeback.